No One Eats Alone Day aims to enable students to help each other and form their own connections without adult interference. "No One Eats Alone is an easy, simple, and fun program that empowers students to reach out to others and include them in everyday activities." Laura Talmus experienced that most unthinkable of events for a parent. Her daughter, Lili, died in her sleep after only 15 years of life. Her death was due to complications with a cranial facial syndrome, but her mother, Laura, said that while Lili was alive, she also suffered from an often-unnoticed affliction: social isolation. “When Lili passed away, it was a group of her peers who came up to me and said that they had really not realized that by leaving Lili out from a lot of the social structure of middle school, but particularly at lunch, they felt terrible and they wanted to know what they could do,” Talmus said. 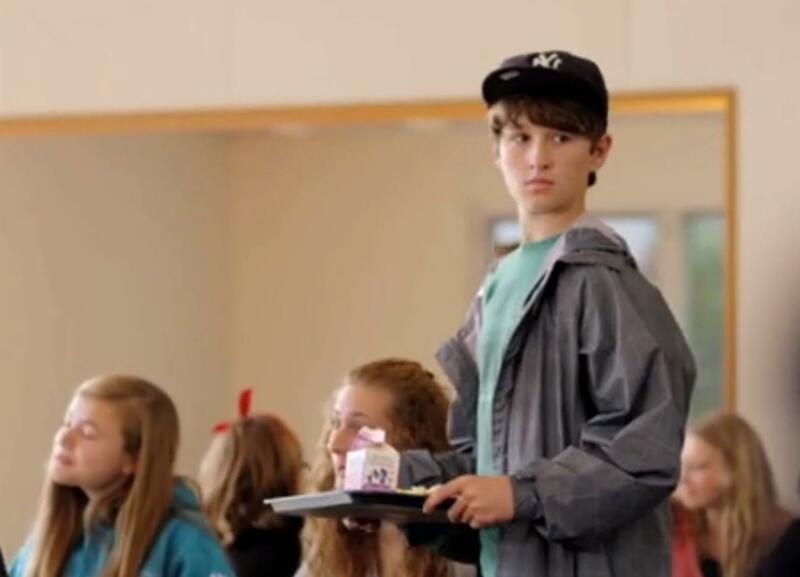 So Talmus and Lili's classmates got together and went to other middle schools to see if students noticed anyone eating alone or without friends. The response, she said, was overwhelming. "It was just mind-boggling how many kids raised their hand in agreement that they felt that way," Talmus said, "or how many kids didn’t realize this was happening, or did realize, but never paid attention until you pointed it out, and said, 'You know, there is someone who always does sit by themselves every day, and none of us have ever invited him or her to come join us, and maybe we should.'" This experience led Talmus and her husband, Ace Smith, to start Beyond Differences, a California-based non-profit that’s working to end social isolation among middle school students and end online bullying. One of their projects is called No One Eats Alone. It’s aimed at doing what the name suggests: Ensuring all kids have someone to eat with during lunch. Schools traditionally attribute isolation to a shy nature. Social isolation has been cited as one the causes that can lead to depression and anti-social behavior, said Paula Fynboh from Sandy Hook Promise, a group partnering to spread the No One Eats Alone program nationally. The goal behind No One Eats Alone -- to eliminate social isolation in schools -- aligns with the vision of Sandy Hook Promise, which was started by parents of Newtown shooting victims to support initiatives that prevent gun violence. The Office of the Child Advocate issued a report in November last year that detailed the educational journey and increasing isolation of Adam Lanza, the man who killed 20 children and six adults in 2012 before killing himself. The report revealed that the Yale Child Study Center had evaluated Lanza and made recommendations for special education services, and warned that if his needs weren’t met, it “would lead to a deteriorating life of dysfunction and isolation.” The school district did not heed these recommendations, according to the report, and Lanza’s mother also contributed to his isolation. In addition, schools traditionally attribute isolation to a shy nature, the report stated. There can be a number of issues that contribute to a child being alone, but No One Eats Alone Day aims to enable students to help each other and form their own connections without adult interference. This year, as in years past, the group has set the day close to Valentine’s Day, which can be difficult for kids who don’t have someone to spend it with, Talmus said. This time around, it’s on Friday, February 13, though some schools have decided to participate in the program monthly. For more information, or to sign up for the program, visit NoOneEatsAlone.org.